For many of us, summertime means fun! No school for the kids, family vacations, get together with family and friends, and more. But for dogs, summer can come with a variety of stresses and risks. Here are a few tips on how to ensure your pup stays safe this summer! Here in Florida, summer comes with hot temps and high humidity. It’s important to remember that dogs can’t sweat and panting doesn’t always fully cool them down. 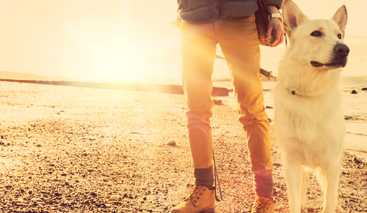 If you’re planning to spend a day at the beach or the park, it may seem like fun to take your pup along, but play it safe and leave them at home. If you do have to take your dogs with you, make sure they have plenty of shade and cool water nearby and watch closely for signs of heat stroke and dehydration including lethargy, dry gums, refusal to eat and loss of skin elasticity. And never ever leave your dog alone in a parked car even for a few minutes. Family picnics can be dangerous for the four-legged kids. BBQ grills can give off alluring aromas that can lead to accidents. Imagine your dog jumping up to steal a burger or two. Paws or a tongue across a burning hot grill can be devastating and result in major burns. Plus, many picnic foods, such as grapes or onions, can be toxic to dogs. If your dogs will be underfoot during family fun, talk to your guests about avoiding the temptation to feed them table scraps. The 4th of July historically has one of the highest numbers of lost dogs. The noise of fireworks and the chaos of crowds can be scary. Even if you’re planning on staying home with your dog, make sure their identification is up to date. An ill-timed open door and the crack of a loud firework can cause your dog to bolt. Dogs find comfort in routine. Regular morning walks, consistent feeding time and familiar surroundings are important to maintain. This doesn’t mean you can’t sleep in a little later or take your dog on vacation to new places but make sure to bring along their favorite bed, toys or other comforts of home. 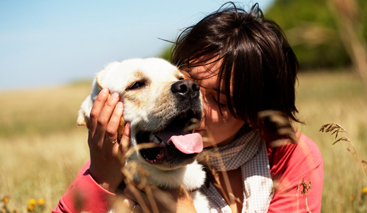 Your dog will love the added time they get to spend with you during the summer months. 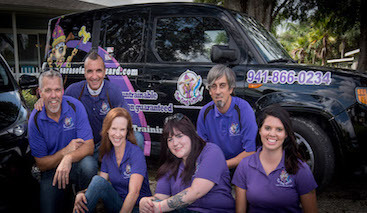 Consider using your free to time to take one of Sarasota Dog Wizard’s obedience classes with your pup or schedule some one-on-one time with one of our private trainers. Following these few simple guidelines can help ensure you create safe, wonderful summertime memories with your pups.